We make decisions every day, some of which greatly affect our future. Did you know that learning a foreign language can actually completely change your life? Learning another language might actually have bigger consequences than you think. Think about the opportunities that could open up for you, if you ventured on a journey of learning to speak a foreign language. It could affect your current career or future prospects. It can certainly make your traveling a lot easier. Moreover, it can also help build relationships with people, and last but not least, it’s a fun activity! How can learning to speak a new language change my life? 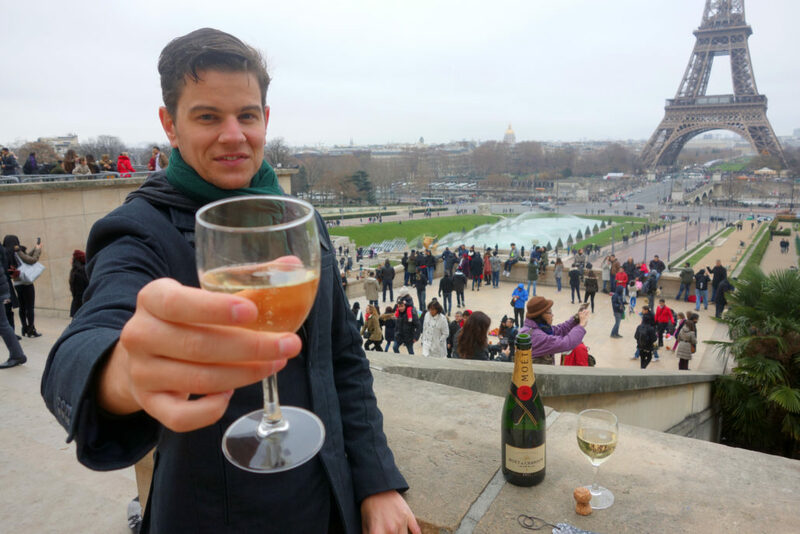 Let me share with you my story of how learning French has changed my life and how it could potentially change your life as well. #1 It’s a fun hobby! We all need hobbies to keep us going through the day, to relax and simply enjoy ourselves. All hobbies we pursue are a great form of entertainment. But, ask yourself – what is the benefit of my hobby? Making learning a new language your hobby increases your knowledge, challenges you, helps you develop new skills, as well as increases your confidence and self-esteem. Now, add some fun to your hobby and you’ve hit the jackpot! Language learning can be fun! Learning French has been exciting and rewarding because each time I learn a new word or new grammar, it feels like I’m solving a small piece of a larger puzzle. In fact, making progress feels like solving a big puzzle. Over time, you start seeing the big picture, which makes it fun and keeps you progressing because, let’s face it, making progress just feels so good! Almost every day before I go to bed, I practice my languages. I read books in French or another language. Sometimes, I also listen to some podcasts, play with some language learning apps or simply talk to people in different languages. Find an activity that you like doing and implement it in your daily routine. Three years ago when I started learning French, I was in Morocco. I decided that after one month of learning French, I would travel to Senegal using the French that I had learned in one month. During my travels in Senegal and Mauritania, I ran into quite a few uncomfortable situations on the borders regarding visa regulations. I was literally stuck and I had to solve those problems speaking French – which, in the midst of that chaos, I was able to do! These travels proved that my French speaking skills would be more than necessary and come to good use. As of 2015, there are 25 independent nations where French is the official language. Speaking French (or any other language) will be a very valuable asset if you want to see more of the French-speaking world. It can help you to get to know a new culture and explore it in a more local way by avoiding the touristy areas and meeting people who are the heart and soul of the country. You can find your way around more easily and make meaningful connections with people. As soon as you try speaking the local language, the locals embrace you more readily and are willing to share their culture with you. Should you run into any problems on your travels, you will not depend on a translator for help with getting your problems sorted out. English may be a global language, but it’s the ability to speak the local language that creates trust and connection. 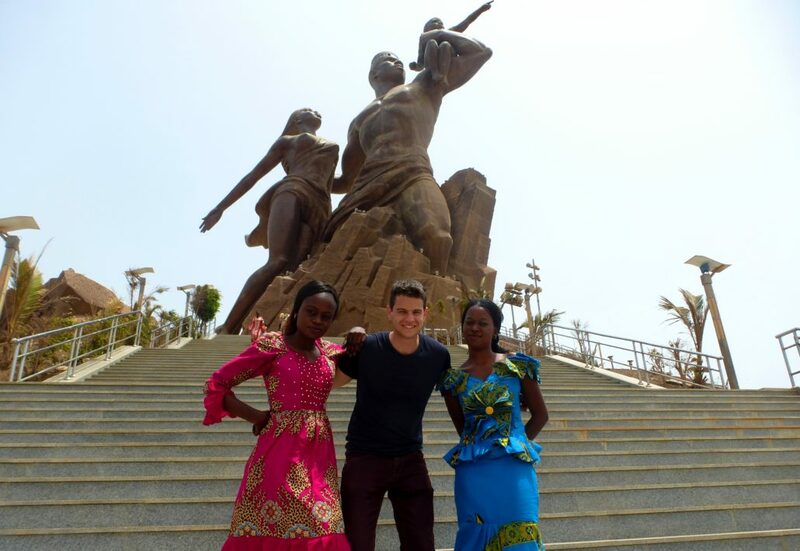 Photo: Posing with locals infront of Dakar’s most famous landmark. Speaking French will enrich your travel experiences in countries like Senegal. Learning a foreign language can open up a world of possibilities for you. If you want to look for a job abroad, it’s essential to master the language of the target country. For me living in Brussels has been the result of me learning French. In addition, there are many expats living and working in Brussels who work for the European Commision, for example, and many of them speak French. Speaking French improves your prospects to be positioned abroad. Companies will be happy to pay you more, provided your language skills add value to the work you do. Potential employers usually consider bilingual or multilingual employees to be a great asset to their companies, especially, if they are targeting the global marketplace or if you are required to travel on business trips to different countries. Amongst numerous applicants with similar abilities, speaking foreign languages will make you stand out. Some careers, such as working in tourism, require you to be at least bilingual. Speaking multiple languages also improves your thinking ability. Research shows that people who speak multiple languages are better at seeing the big picture and are therefore capable to make better decisions. Whatever the case, being able to speak another language can have a positive impact and improve your career. Maybe the most important reason to learn another language is for a relationship or romance. This is the biggest way in which learning French has made an impact and changed my life. Had it not been that I was learning French, I probably would have never met the girl who later became my girlfriend. Although, we began our communication in English, we built our connection on the fact that I was interested in learning French and things went from there. Speaking French was the reason I came to Brussels and speaking French was the reason I connected better with her. Why is learning a new language important for relationships? People look for ways to connect with other people. Those connections will be more intense and meaningful if both of you speak the same language. However, if you’re approaching a person with a different native language than yours, and you make an effort to communicate with them in their language, people would see that you respect them and their culture. This would instantly make them more open to getting to know you. This has been my story of how learning a language (French) changed my life. You may have your own story. You can have many reasons for learning languages, similar to ones I have shared with you here. Whatever those reasons might be, you can be sure that speaking a different language will positively affect you, your work and your relationships. If you are thinking about picking up a new hobby and start learning a new language, just remember: set realistic goals, keep your motivation high and don’t give up, because, learning a language can change your life! Do you want to learn French as well? Get our FREE mini-course and learn how you can become conversational in French in only 7 weeks. 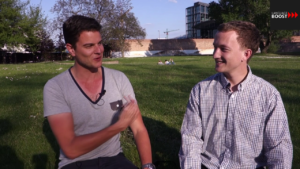 Jan van der Aa traveled to over 100 countries and learned 10 languages in his twenties. On this website he shares his language learning experience and helps people from all over the world to learn languages faster.